This kids Christmas Treasure Hunt is printable and soo easy to set up and play. 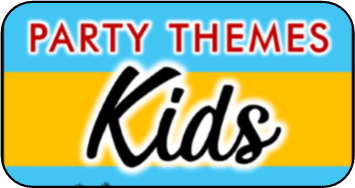 You choose the hiding locations so you can play this party game anywhere! This puzzle includes 10 full colored game puzzles all themed around the Christmas season. Each puzzle / clue is different and requires a different way to solve it, but all the clues have a numerical answer. This is because once they solve the clue they will look on there clue locator guide to determine where they must look for there next clue. So if the answer is 13, they will look under number 13 on their clue locator to see what place is written next to it. This is the place they will find their next clue. 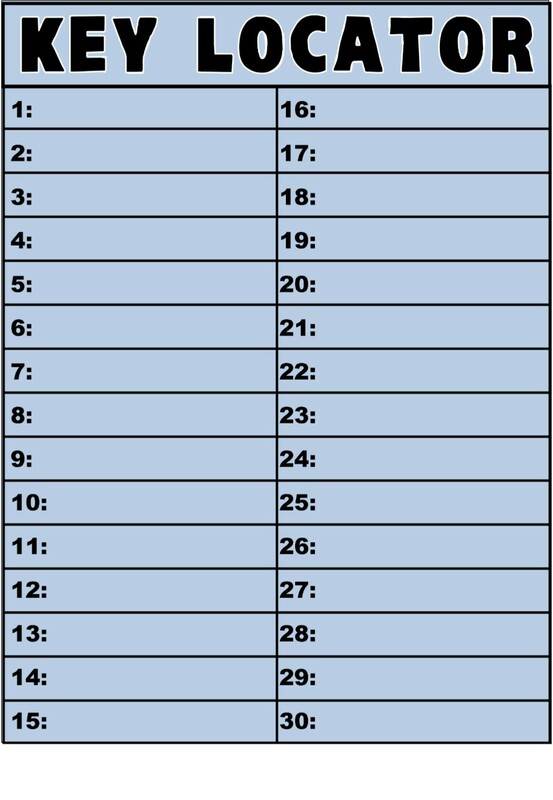 The clue locator guide is included in the hunt, you fill out the locations. This is what makes this game especially awesome, because it lets you decide where the hiding locations are. This means you can play the game anywhere. Below you will find an example clue. I'm using it to show you how the game works. In the clue above players must determine which Santa match the one in the box on the left. The answer is Santa number 13. 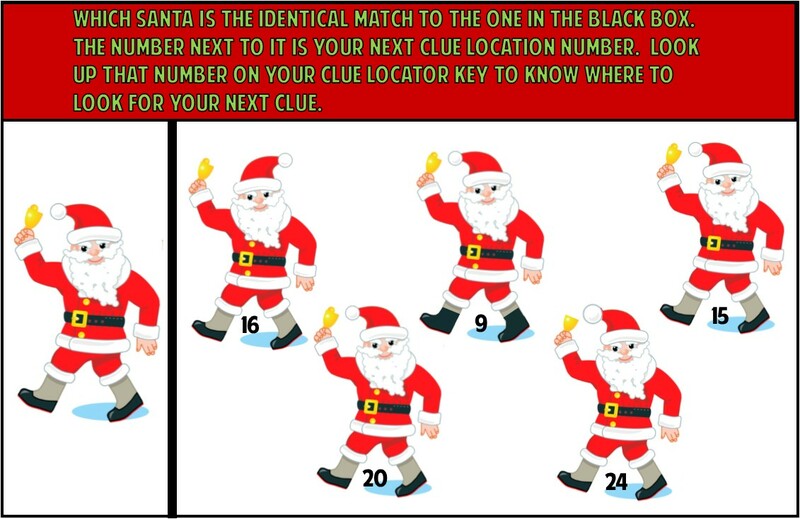 Once the kids figure this out the look on the clue locator guide they were provided (example below) and determine where to look for there next clue. So you fill out the key locator before the hunt with the hiding locations you want to use. Only 10 of the hiding locations are used, the rest are decoys. For the clue above the answer is 13, so the kids would look at the place located for number 13. In this example it is the linen closet, but you can fill out the key locator however you want. When the kids look in that location they will find the next clue and so forth until they complete the hunt. 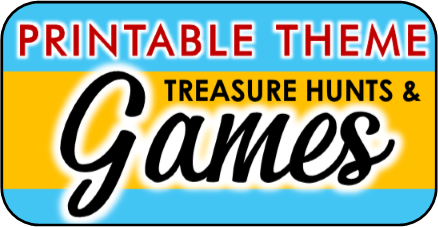 What age is the Christmas treasure hunt suitable for? Ages 6 - 12 The hunt comes with TWO different versions, the original version and an easier version. You can choose which one is best for your event. How long does it take to play this Treasure hunt? Between thirty minutes and an hour. Is the hunt cooperative or competitive? There are instructions on how to play it both ways. 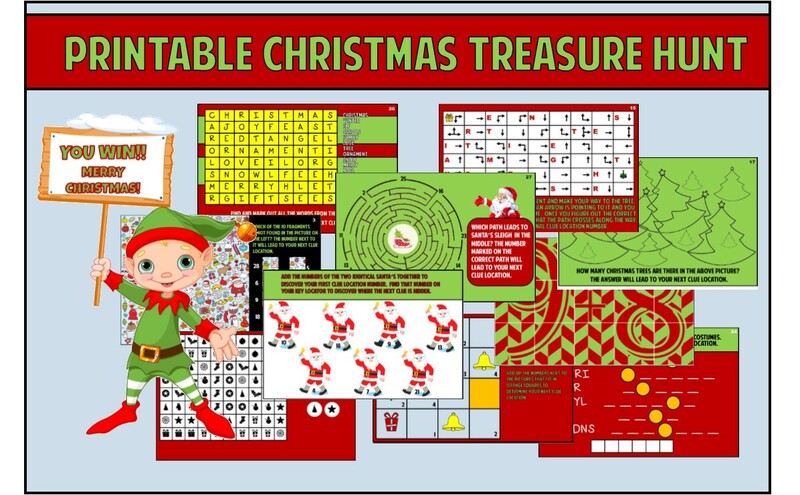 What all is included in this printable Christmas treasure hunt game? How long does it take to receive my treasure hunt? Once you complete your order you will receive an email with an INSTANT DOWNLOAD link within minutes.